Veteran American actor Frank Vincent, known for roles in the TV series The Sopranos and several Martin Scorsese films, has died at the age of 78. He had complications during open heart surgery in a New Jersey hospital, TMZ reports. In HBO's The Sopranos, he portrayed gangster Phil Leotardo, the nemesis to the main character Tony Soprano. He also played tough guys for Scorsese in Raging Bull, Goodfellas and Casino. 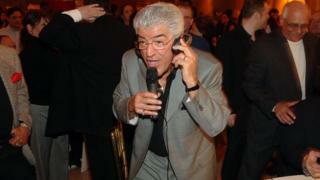 Frank Vincent had a heart attack last week, TMZ reported. He was born in North Adams, Massachusetts and was introduced to show business at an early age by his father, an amateur actor. He made his acting debut in 1975 in Death Collector, by director Ralph DeVito, his website said. Scorsese saw his work and cast him for Raging Bull, in 1980. During his 41-year career, Vincent often played mafia characters, most notably in Goodfellas, in 1990, when he portrayed Billy Batts, who famously ended up beaten to death by Joe Pesci's Tommy DeVito. Vincent was also a musician, comedian, producer and author - he wrote A Guy's Guide to Being A Man's Man. Actor Vincent Pastore, who co-starred with Vincent in The Sopranos, said in an email quoted by website The Blast: "We lost a great character actor and great man... May he always stay in our memory." The Sopranos - the new Shakespeare?